L. Hostilius Saserna. 48 BC. AR Denarius (3.88 gm). 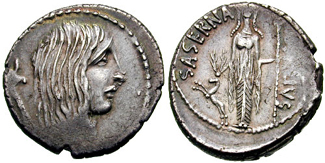 Head of Gallia right; carnyx behind / L. HOSTILIVS SASERNA, Diana of Ephesus standing facing, holding stag in right hand, spear in left. Crawford 448/3; CRI 19; Sydenham 953; Hostilia 4. Toned VF. $295.